← July 2012 Hottest Month Ever in U.S.
Development of a high end apartment complex in a low income area would force pre-gentrification people out of the neighborhood. The taxes would get raised to amounts that make it difficult for these people to afford. However, the people in charge of this project are ignoring the consequences and focusing on the 5 million dollars tax break. The photographer’s work can be found here. 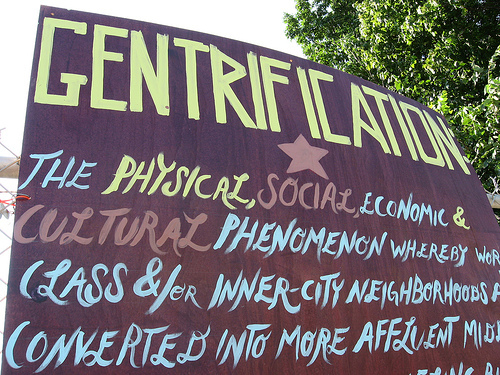 This sign went up in to 2006 protest the mills-to-condo developments in Providence, Rhode Island.